Ella Rhodes reports on American Psychological Association guidelines. 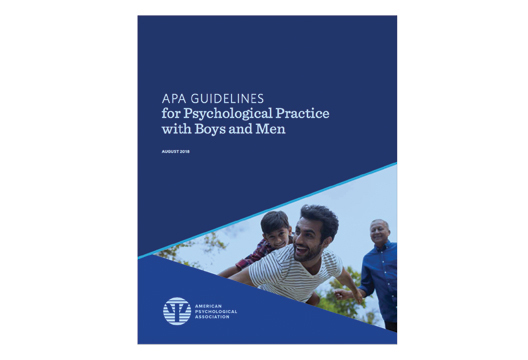 The American Psychological Association recently released psychological practice guidelines for men and boys. Based on 40 years of research, the guidelines suggest that psychologists should be aware of the impact of certain elements of masculinity which may have a negative effect on men’s mental health. While APA guidelines for working with women and girls were published over 10 years ago, the current guidelines for practicing with men and boys have been met with outrage in some sections of the media. While they have been in development for 13 years, some have suggested their publication is ideologically motivated. The 10 guidelines, each presented with relevant evidence and potential applications in psychological practice, attempt to help psychologists tackle the barriers that might lead to the difficulties men face. In their introduction the authors point out that the varied social identities men have affect the way they experience and perform masculinity – which can have both negative and positive effects. The guidelines suggest, among other things, that psychologists should be aware of each individual man’s experience of masculinity and understand its social and cultural context. They should encourage positive father involvement and healthy family relationships. They point to the importance of understanding the impact of privilege, power and sexism on boys’ development, and how this may affect their relationships with others. Psychologists should also be aware of the special issues boys face during education: a disproportionate number of boys struggle academically, particularly those from African American and Latino communities. When working with boys and men, the guidelines suggest, psychologists should be aware of the problems with aggression and violence many men face and understand these at both a cultural and individual level. - See also a letter in this edition.